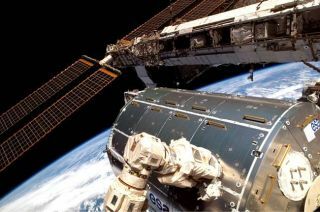 The European Space Agency's Columbus lab is photographed by an astronaut inside the International Space Station during NASA's STS-122 mission to the orbital outpost. Lights on Launch Pad 39A at NASA's Kennedy Space Center reveal space shuttle Atlantis following the rollback of the rotating service structure, or RSS, the night before launch. The RSS provides protected access to the orbiter for crew entry and servicing of payloads at the pad. It will be the third launch attempt for Atlantis since December 2007 to carry the European Space Agency's Columbus laboratory to the International Space Station. STS-122 mission crew members gather for the traditional breakfast at NASA's Kennedy Space Center before they launch on space shuttle Atlantis to the International Space Station. Around the table, from left, are Mission Specialists Hans Schlegel and Stanley Love, Pilot Alan Poindexter, Commander Steve Frick, and Mission Specialists Leland Melvin, Rex Walheim and Leopold Eyharts. Schlegel and Eyharts represent the European Space Agency. During their 11-day mission, the crew's prime objective is to attach the laboratory to the Harmony module, adding to the station's size and capabilities. Mission Specialist Leland Melvin signals that it's go time for the launch of space shuttle Atlantis on the STS-122 mission while he dons the launch and entry suit. Mission Specialist Rex Walheim is eager to finish suiting up for launch of space shuttle Atlantis on the STS-122 mission. Steve Frick is happy to be suiting up for launch of space shuttle Atlantis on the STS-122 mission. The STS-122 mission crew pauses alongside the Astrovan to wave farewell to onlookers before heading for Launch Pad 39A for the launch of space shuttle Atlantis on the STS-122 mission. From left are Mission Specialists Leopold Eyharts, Stanley Love, Hans Schlegel, Rex Walheim and Leland Melvin, Pilot Alan Poindexter and Commander Steve Frick. Against a backdrop of blue Atlantic Ocean, space shuttle Atlantis with its crew of seven rises majestically from Launch Pad 39A at NASA's Kennedy Space Center to start the STS-122 mission to the International Space Station. Liftoff was on time at 2:45 p.m. EST. NASA Administrator Michael Griffin watches the launch of space shuttle Atlantis on mission STS-122 from the Launch Control Center at Kennedy Space Center in Florida on Feb. 7, 2008. Atlantis soars skyward as seen through the louvered windows of the Launch Control Center at Kennedy Space Center in Cape Canaveral, Fla.
Its twin columns of fire merged behind it, space shuttle Atlantis is propelled into space on mission STS-122 to rendezvous with the International Space Station.